There’s a Corporation trolleybus waiting to depart on service 42 (anti-clockwise). The trolleybus wires show the ‘siding’ up to the station where trolleys on Race Specials would wait. In the late 40s on returning from Clapham Junction with my mum, I lost a train under a train. Let me explain. I had a model steam train about 2 foot long including the tender, which was painted in the colours of Southern Railway. I was shunting this train along the platform when I shunted it a bit too hard and it went under the train we had just alighted from. This scared me a bit, probably for fear of getting into trouble for the accident and also the loss of my toy train as it disappeared into the depths. My mum must have said something to somebody, because the train was shunted out until my train was visible. Then a rail worker jumped down and retrieved it for me. I had a feeling of well being having my train back. I can remember the man shaking my hand and my mum saying to me to thank the man which I did. I was so pleased that I had gotten my train back. Then on to a number 7 bus and home, with my mum holding the train. I remember going to Brighton Station (when I was 4 years old) with my two sisters and my Mum and Dad. We went to visit my Uncle Jim (my Dad’s brother). I had a game of chess with my Uncle Jim in their flat above the cafe he owned by the train station. My cousin, Anne Annets, became a dancer at the Palladium in London. 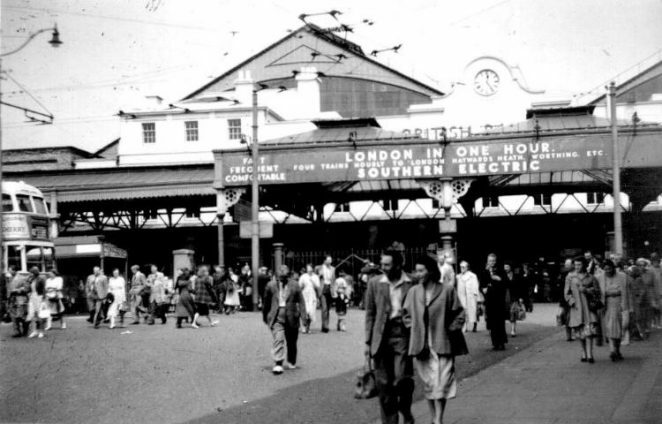 The ‘siding’ was removed some time in the late 50s when demand for Race specials declined, but the hooks that anchored the two wires onto the station facade remained for many years. This removal predated the closure of the 42/44 trolleybus route. Jim was my father-in-law. They had a cafe at Brighton Station from 1947 to 1974. Regarding Anne Annets: quite correct she was a dancer, but it was her sister Pam who was at the London Palladium. Jim was my grandfather and both Pam and Anne Annets are my aunties. I’ve been pulling a family tree together recently and would be pleased if either Jeff Annets or JT could get in touch with me at philip@annets.fsnet.co.uk to help me fill in the Annets side in more detail. …and you could buy a tiddyoggi at Divalls across the road from the station. I remember the tiddyoggies at Divalls Cafe. I worked in the cafe across from the station. The bus drivers and conductors used the cafe and were a smashing lot. I think it was about 1959-69. We also used a pub over from the cafe end of Sussex Street. Hi Sandie – did you actually work in Divalls? My husband does not remember you -his parents had the cafe from 1947 until 1974. Tiddyoggies at Divels Cafe! I always wondered what they were, then my dad Charles Kite told me they were Cornish pasties. No Julie, I didn’t work at Divall’s, I worked at a cafe opposite the station, I think called the Railway Cafe! Divall’s was over the road on the left as you looked out. I remember a bakers up from Divalls that sold gorgeous lardie cakes – yum. I never ate a tiddieoggie as I didn’t know that they were pasties. My Great Grandmother, Ellen Sherwood (known as Nellie by many), ran the Newspaper stall outside Brighton Station for 50 years. Intitially she ran the stall with my Gt Grandfather, but he was tragically killed outside the Station in 1944. She continued however for a further 30 years, retiring I believe in 1974. Re Divall’s coffee shop: I am trying to get some info about the background of Divall’s Cafe as we (me and my mate) are taking over the lease of the shop. The first thing is that I didn’t know that it is that old, as I am not that old (I am 30 years old). It is a bit funny for me to own a shop which is probably three times older than me. Does any one know what Divall’s means or refers to? Also does anyone know more about the history of the building? I’d like to say that I remember Divalls with great affection as I met the lady who has that SPECIAL place in my heart there and if it hadn’t been for Divalls then, I might never have met her. I only wish that I could have got 2 of the mugs from there so that I could give one to my love so that we can drink from those mugs thinking not only how we met but, of the best cafe in Brighton. Oh dear! Today, 60 years after this picture was taken, despite new technologies the time it takes to travel from Brighton to London is still the same! So how do the rail companies justify their outrageously steep ticket prices? Does anyone remember Johnsons Photographic shop along Queens Road? It was my grandad’s and I have never been able to find any pictures of it. You are right about the time of the fast train Leo, but I wonder if the early morning milk train still runs. My pal and I in 1956, when we got our bonus from Allen West caught the milk train, about 4.30am I think. The fare was cheap, 4s.6d (22.5p) return ticket. The train was full of workmen and it stopped at every stop to Victoria. It took, in my memory 2.5 hours. We enjoyed our day in the smoke shopping and at Battersea Funfair and came home on the last train. Tiddyoggies! Yes, I remember them. I was about four or five years old (early 50s). I went down to explore the kitchen in the cafe. I would have preferred to go down in the dumb waiter, but I wasn’t allowed. I watched an old lady, with long grey hair and a long fag hanging out of her mouth, she was making something with her hands, Tiddyoggies! Yum. Remember the 1/- meals in Divals, 1/3 if you had either a rice pudding or steamed pudding. Happy days. Re Divall’s cafe; as I recall I have a school friend whose Aunt owned the cafe back in the late 50s early 60s, surname Divall. The friend now lives in Shropshire. I remember Brighton Station in the fifties very well. My favourite aunt used to travel down from London every second weekend to visit her parents and the rest of the family. She was quite well to do and I recall meeting her at the station and riding in great luxury I thought in a Standard Vanguard taxi. I think I was about 9 or10 years old at the time. Those were the days indeed. I well remember the cantankerous barber just round the corner from the station where I got my first Tony Curtis haircut. He was a cranky bugger but a good barber. I was only 13 at the time and boy did I cop it when I got home. I remember opposite the station there was a grill bar, and coming from a very religous family I often wondered what went on in there. Loved Brighton, best place in the world to grow up, unfortunately I was dragged off to Oz in 1956 and have never been back since. Could someone please help me? I’m trying to trace Mr Paul Annets formely of Ace. I remember dining in Dival’s -JFK got shot, then on to the milky bar Queens Road. Paul get in touch. I lived in Mount Zion Place which was close to the station. During the 1950s the circus used to come to Brighton on the train and parade down Queens Road. I remember one year, at the age of about seven, I tried to ‘stroke’ an elephant as it walked past and ended up with no skin on my knuckles. Concerning Richard Elms, contact me on paul.annets@ntlworld.com. Often wondered what was happening with you. In the 1950s I remember my mother working in the OK cafe just around the corner from the Queen’s Head at Brighton Station. She then worked on the snack bar in the Queen’s Head for many years. When the boss and his wife moved to the County Cricket ground in Hove she went with them to continue a similar job. Divall’s was a lovely small cafe and the teaspoons were connected to a small length of chain which in turn was nailed to the counter! I remember the Standard Vanguard taxis in the station operating under the banner of ‘Streamline’. I just bought an album of shop fronts from Brighton in the late forties. One image depicts Divalls. The Album is from an estate agents and says Sold Brighton. Signage doesn’t mention Tidtoggies although I recall that and always wanted to know what they were (pasties). Signage says Fastest Service on Record in HUGE letters. Brightons Busiest Cafe. There are two recognisable women at the window (cafe workers). Two eggs and chips were 2 shillings, interestingly cod and chips was less at One and Six. Sandwiches ranged from Heinz Spread at ten pence to one and four for a ham. This was for a full round and was cut by a machine. There are no prices for half a round (ONE slice?) I would be interested if anyone can tell me the location of other shops in the album: The Katrine Cafe, Gurneys Montpelier Stores, Barbers Restaurant the Sussex Grill, Marjorie Furriers (slightly used), Beddoes Tobacconist Smith and Brown Ltd, (Coop Clothing), Geo Collins and Son Garage, Bannister and Sons (N’haven), E D Manns Grocer Hove, Eltentons grocery stores, Priors Grocery and Provisions, A S Wickens Quality Footwear and Distintive Repairs. Hi JJW. Congratulations on making such a find – perhaps you might like to share some of the images on the website, as they are always of topical interest as ‘then and now’ articles to our readers. The Katrine Cafe was at 4-5, King’s Road, serving home made cakes and sweets; Madame Gurney was a Costumier at 214, Church Road; Ralph Barber had Restaurants at 76, 77 & 134 King’s Road and also in the Arches; Marjories was an Outfitter at 93, Church Road; The Sussex Grill was a Restaurant at 71, Ship Street; Smith & Brown’s Co-operative Clothing Stores were at 19-20, Trafalgar Street and 24-24a, Sydney Street; George Collins & Son were Mechanical Engineers on the Patcham Bypass, London Road; Bannister’s were Motor Engineers at Elder Place; of the Grocers E.D. Mann’s was at 120, Church Road; Eltenton’s was at 1, York Place and Prior’s at 85, Western Road. A couple of the names drew a blank, but it would appear the list may have been around the time of the end of the war, rather than later. Regards, Andy. Regarding the comments from JJW & A Grant. I know that a company called W F Bannister (B’ton) Ltd was at Park Crescent Place from at least the early 60s until they moved to the new industrial estate in Coalbrooke Road. I worked there from 66 to 70. They were general engineers making moulds for injection moulding (Vacco Flasks etc) sharpening industrial guilotine blades through to designing and building a machine that reconditioned golf balls but also reconditioned motor engines of all types from small (lawn mower size) Aston Clintons to large Gardener diesels. I remember the spoon on a chain, to stir your tea so that you couldn’t pinch it (the spoon ) in Divalls cafe. Can anybody remember a parade in Brighton, I would say around 1945, in which a young child was caught under the tracks of a tank in the parade? I think he was killed. Any information as to where this happened I would like to know to help unravel a mystery. I was not a day tripper but a Portslade schoolboy and student on route to the Building and Engineering School and the Municipal Technical College, so I was very familiar with the station from 1951 to 1960. On a Friday we would scan the yards for the latest engine made in the Brighton workshops. Can anyone tell me their registered numbers and how many were made in Brighton, did they begin 40 or 70 or is my memory completely shot? One of my greatest delights and memories was riding the Horsham Flyer before that line closed. The carriages were open plan with moveable arm chairs, those were the days!! On leaving and returning to the station each day it was by way of the tiled tunnel and smelly toilets into Trafalgar Street then out onto the London and Lewes Roads by St Peters Church. Too many interesting shops meant that I was often late for school, detentions were then curtailed so that I could catch the train home. Many thanks for sparking off memories. I was interested to see the article on Brighton shop fronts (JJW 17/5/2011) as JJW mentioned my Granddad’s garage at patcham. Granddad and my Dad started the garage around 1929 and owned it until 1952. It was a petrol station mechanical engineers and an engineering works which during the war years had 12 or 14 ladies working the lathes. It would be great to see the old photo if there is a way of getting a copy. I have been investigating my mother’s family history and she remembers the cafe. My great uncle Benjamin Divall born 1874 is shown as running an eating house in Brighton in the the 1899 Kelly directory and the 1901 census, his father, also Benjamin, was a shoemaker originally from Ringmer. Seems there were at least four Divall’s eating houses/cafes at: 48 Lewes Road (now a Domino’s pizza), 25 Middle street (became Vesuvio Italian restaurant, now flats), New England Road (no number known) and 3 Terminus Road. The latter was run by Benjamin’s younger brother Edward and his wife Alice (nee Beard) but Edward sadly died in 1936 with a heart attack. My mum went to stay with Alice just before the war and still ran the cafe. Alice used to attend the Railway Mission (now the Calvary Evangelical Church). My mum remembers the Divall family used to meet regularly for fish and chip suppers together. Also working in the Cafe according to my mum was Jack Divall, Alice’s nephew, who married Mabelle Sainty. The death of Alice Divall in 1949 seems to tie in with the note about the Annett family taking over the cafe in 1947. My mum also heard a phone-in on BBC Radio Sussex recently where the cafe was mentioned. Have not visited the refurbished Divall’s cafe yet, but hope to soon. Sara, it looks like Winifred Alice Divall was the daughter of George Edward and Jane Divall (b 1872 a tram conductor according to the 1911 census) and brother of Jack who worked in the cafe. In the late 70s or early 80s, while doing a milk round in the vicinity of the station, I had eggs, beans and tomatoes on toast at Divalls most mornings. While waiting for a train a couple of weeks ago, out of nostalgia, I went there again. You know the old saying “Never go back”? I should have obeyed it. The name’s the same, but nothing else. The nice man behind the counter is Iranian – I asked. I think he delivers your order to some out-of-sight staff behind him. I just had a coffee. Nice, clean and tidy, was the impression I got. But somehow I missed seeing that grumpy old man who used to sit near me, reading the horsey pages in the Mirror, with a hole in the sole of his shoe indicating that he wasn’t too lucky with his bets. My nan and granddad ran Divalls from 1938 to 1946. Nan’s maiden name was Divall, Eva Divall, and granddad was Jim Brewis. Previous to that, Divalls was run by Nan’s sister and brother-in-law, Gladys and Reg Wiltshire. My nan and granddad lived above the café during the early years with their daughter Miriam who is my mum. At the top of Terminus Road there was a children’s home which received a direct hit from a bomb, granddad being in the Red Cross bore witness to the tragedy. My mum’s email address is derek.pearce3@btopenworld.com if anyone wishes to ask for more information. Hi Caroline, I was born in 1941 and about the age of 3 years I was taken by my mother to Divalls for a drink, and while we were there a plane came over low and the lady who owned the shop pulled us down the steps to a cellar. I have never forgotten that day, and on a visit home in February this year we went back to the shop for a cuppa. Of course the steps are not there now, just a wall. The new owners said she never knew about a cellar so I explained where it was but there is a downstairs shop front. Some things you never forget. It might have been your dear Nan. I must have been about 3 or 4 when I first saw a similar scene as that shown in the photo back in the late 40s. My parents had taken me down to Brighton to visit relations, and it seemed a great adventure in those steam-driven days all the way from London. When we got out of the forecourt of the station, my mother pointed to the shimmering sea in the distance. It was my first sight of that kind of water, and in my naivety, I immediately thought that the sea was a big blue wall, and wondered how we would get over it!